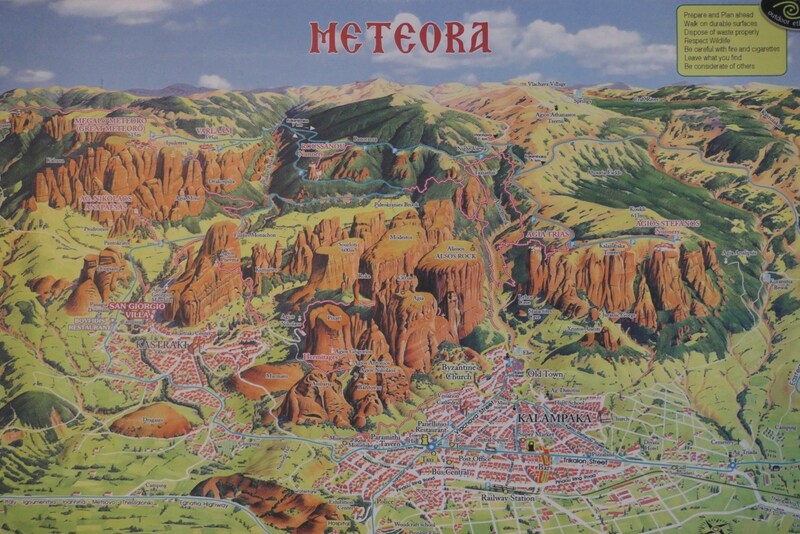 SEE ALL THE TOURS that visit Meteora in guided tours or train trips. The Delphi and Meteora tour operates April – October: Mon, Wed, Thu & selected Saturdays. CLICK and see the dates. From November – March this tour operates ONLY on Wednesdays. However, we believe that one day in Kalampaka is not enough. Give your tour an extra day – it will not be wasted and you will not regret it. April – October depart on Wednesday and return on Friday. You follow the guided groups on Wednesday and Friday, and on Thursday you explore Meteora on your own, otherwise, CLICK HERE and see our 3day/ 2nights tour by train, spending 1 night in Kalambaka and 1 in Delphi. * If our offers sound interesting read the “4 steps to book” in the footer and start communication. – Pick up / drop off from your hotel or near it (See the list of hotels in the footer of this website). (This service is from hotels in central Athens. The airport and the Port of Piraeus are not in Athens). – Entrance fees to Delphi site and the 2 monasteries that are open on the day that you visit Meteora. – Services of the professional tour guide all along the tour. – 1 night hotel accommodation in the hotel of your choice. – No hidden costs or surcharges. We offer the best price and we assure you that you ‘ll have a great tour. NB:Lunches on both days are not included. The bus stops at local restaurants, but the lunches are extra. a) Share a triple room with a friend and save 5% on the double room rate. c) 5% ADVANCE BOOKING and payment discount. Follow the following 3 steps and save. # SUBMIT your booking request form 4 months before the tour departure. # WITHIN ONE WEEK following our confirmation, pay a non refundable deposit of 50.00 €, p.p. # TWO MONTHS before the departure of the tour, settle the balance in full. This tour includes two of the most important sites, on mainland Greece. It presents a picture of ancient Greek civilisation beginning with the Mycenaeans, the Greek Bronze Age, and continuing through Archaic, Classical and, to a lesser extent, Hellenistic and Roman Greece. It provides a glimpse of the spiritual splendour of Byzantine art and architecture. It is a full itinerary, but the pace is manageable. Plenty of time is available on the sites, allowing time for adequate exposition by the tour guide and time for further exploration on your own. * The traditional village of Arachova. * The modern Village of Delphi. * The sanctuary with the temple of Apollo and the Oracle of Delphi. * The monument of Leonidas, the Spartan King, in Thermopylae. * 2 monasteries are visited. One of them is the nunnery of St. Stephen. * NB.The archaeological museum in Delphi is not visited in this tour. The museum is included in the 3 days Delphi – Meteora tour. According to the myth, Zeus released two eagles. One flew east and the other one west. They met over Delphi, determining that the centre of the world was there. A temple dedicated to god Apollo was built there in the 7th c BC. The oracle of Apollo became a religious centre where common people and kings alike, came to consult the priestess of the sanctuary. The ARCHAEOLOGICAL SITE consists of the temple of Apollo, the treasury houses, the theatre, and the stadium. Beautiful rocks from another world embrace Kalambaka. The monuments are under the protection of UNESCO and are recorded as the second largest Monastic community after the Holy Mountain. It’s a region of inaccessible sandstone peaks where the monks found protection and settled on these “columns of the sky” from the 10th c. onwards. 24 monasteries were built, despite incredible difficulties at the time of the great revival of the monastic ideal in the 15th c. Their 16th c. frescoes mark a key stage in the development of the post-Byzantine painting. The monasteries at Meteora grew out of the need to avoid Turkish persecution during the occupation in the 14th c. Monks lived in caves in the rocks of Meteora since the 11th c. but the inaccessible peaks provided safety for Greek Orthodox monks. Over time a large number of hermitages and monasteries were built on these rocks, making Meteora the second largest monastic complex in Greece after Mount Athos. Seeing the beautiful stone structure, surrounded by mist, is enough to make you understand why the monks and nuns selected this area for unceasing prayer. Today, from the many monasteries that existed, only six are open to the public: The monasteries of St. Nicholas Anapafsas, Grand Meteoron, Varlaam, Roussanou, Holy Trinity and St. Stephan. It is worth noting that the religious monuments mostly visitored in Greece are the Holy Meteora. Over a million people visit the area of Meteora every year and admire this “unique” natural phenomenon. DAY 1: The bus starts the pick up at 07.30am and, traffic allowing, it departs from the terminal in the centre of Athens at 08.30am. Passing by THEBES (the town of mythical Oedipus), LEVADIA (short rest room stop) and the traditional village of ARACHOVA, you arrive in DELPHI, the famous “Temple-Bank”, at +/- 11.30am. Delphi was considered by the ancient Greeks to be “the centre of the universe”. With the professional tour guide you will explore the legendary site of the Oracle. 13.30 The group proceeds for lunch, and at +/- 14.45 departs via AMPHISSA, LAMIA and TRIKALA for Kalampaka with a short photo stop at THERMOPYLAE, the site of the famous battle between the Spartan King Leonidas and his 300 Spartan soldiers against the huge Persian army of Xerxes 480 B.C. took place. Arrival at your hotel in Kalampaka at +/- 19:00. Overnight in Kalambaka. (Dinner is optional). DAY 2: 08.15 After breakfast on the way o METEORA, you pass by a local art studio where you learn about the technique of painting of the icons and what an icon means for a Greek Orthodox Christian. You then drive up to the rocks and visit two of the monasteries that are open on that day. 12:30 Return to Kalambaka for lunch and at +/- 14:00 you start the return to Athens and arive in Athens between 19.30 – 20.00. 13:45	Proceed for lunch at a local restaurant (optional). 15:00	Continue to Kalanbaka via Thermopylae(photo stop), Lamia, Karditsa & Trikala. 09:00	Drive to Meteora and visit 2 monasteries (entrance fees included). Meteora is one of the most beautiful areas of mainland Greece and the monasteries are one of the country’s most unique attractions. Join one of the following tours and visit Meteora. 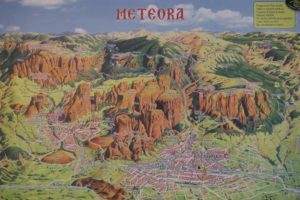 CLICK HERE and find all the different options (guided tours and independent tours by train) and visit Meteora. QUESTION: How many hours do we stay at the ancient site in Delphi. ANSWER: You spend 1.30 hour in the ancient site of Delphi. QUESTION: Is there any free time, or is it all guided? ANSWER: There is free time but I suggest you break from the group as early as possible. The tour doesn’t go to the top of the mountain to see the Delphi stadium. AT METEORA: You spend about 1 hour in each monastery but there is no need to break early. Appropriate clothing is required to visit the Monasteries and nunneries. Skirts below the knees for ladies and long trousers for gentlemen. The monasteries/nunneries provide wrappings that the visitors can wear them over their clothing before entering. FREE TIME: After the guide takes you around, you have enough time to see whatever is left to see. AT DELPHI, the 2 day tour to Meteora meets the 3 day classical tour, and the tour company usually moves guests travelling to Meteora onto another bus and they proceed to Kalambaka and visit Meteora together. For the 2 day tour to Delphi and Meteora clients: The restaurant in Delphi is 3 km after the modern Delphi village. If you decide to take the tour without lunch, you can ask the tour leader to drop you at the entrance of modern Delphi, and +/- 1 hour later to pick you up from the same point for the return to Athens. CANCELATIONS If you cancel 7 days before the departure, there is no cancellation penalties. If you cancel between 3 and 6 days before the departure, there is a 50 % cancellation penalty. If you cancel within 2 days of the departure, there is a 100 % cancellation penalty. My family and I are just back from a wonderful trip to Greece. I’d done some research and bookings before I ran into a brick wall trying to book train tickets to Meteora. Searching around I found a note by another traveller on Tripadvisor, who’d had exactly the same problem and stumbled on Astoria Travel. He’d had a great experience with them and recommended them highly. So I contacted Kosta at Astoria, and am blessing my stars that I did so! If we had a good, sensibly planned trip in which we saw as much as we could without being run ragged, it was thanks to Kosta. Over the course of several emails he helped refine my plans; even to the extent of arranging to hire a taxi from Delphi to Levadia railway station to catch the train from there to Kalampaka and not lose a day. I visited them at their office in Athens. It was impressive to see that Astoria Travel has been in business since 1958, and through experience have been able to attune their services and offerings to a very wide range of traveller indeed. Their list of contacts is vast, which worked helpfully in our favour: Kosta just picked up the phone and got a taxi to pick us up at Kalampaka station (paying no more than the normal rates, despite being booked ahead). Moreover, they are a family-run concern, so their levels of friendliness, personalisation of services and traveller support is several notches higher than what a more impersonal agency could provide. I would highly recommend Astoria Travel not just for booking tickets, tours and hotels, but for help and advice in planning your holiday as well. He graduated from a University in South Africa, his English is excellent and he is highly knowledgeable and courteous. The tour departs from Athens and returns to Athens. After checking in the hotel, you can actually explore the town of Kalampaka and don’t miss the 9th century church at Kalampaka. The church is about 15 minutes walk from the hotel. Just came back from 2 days Delphi and Meteora tour arranged by Kosta. He gives such good service with fast replies and issuing of vouchers. Kosta gives excellent value for money. He is highly knowledgeable, caring and courteous.ery trust worthy. There were 6 of us going on the tour and on the morning of the tour, he personally came by and make sure we got on the tour! Great discount for the tour and we did save €’s by booking with him rather than direct with tour company or Viator. On the bus we met and became good friends with a couple that bought their tour from Viator and we could compare prices and services for the same tour in the same hotel. Kosta gives excellent value for money. He is highly knowledgeable, caring and courteous. His English is excellent, he is very experienced, extremely helpful and proud of Greek history and Greek culture. In the footer of this website you find the “4 steps to make a booking”. If our offer sound interesting, please send us the booking form. Day 1: Arrive in Delphi at +/- 11:30. Visit the famous “Temple Bank” of the ancient times, dedicated to the God Apollo, and see the Temple of Apollo, the Treasury of Athenians and in the archaeological Museum you will see fantastic Greek sculptures like the Sphinx, the famous athlete Aghias, the handsome Antinoos and the bronze Charioteer. Day 2: The morning is free to explore the ancient site of Delphi. After lunch leave for Kalambaka through the town of Lamia. On the way, a short stop in Thermopylae, the place where the 300 Spartans (fought against the Persians) is in the plan, to see Leonidas Monument. Arrive in Kalambaka at +/- 19:00. Overnight. The Delphi and Meteora tour operates April – October: Sundays, Tuesdays, Wednesdays & selected Fridays. CLICK and see the dates. -1 night in Delphi & 1 in Kalambaka in double room. -The entrance fees to Delphi site and the archaelogical museum are not included. -Taxes, except the hotel overnight tax. According to the myth, Zeus released two eagles. One flew east and the other one west. They met over Delphi, determining that the centre of the world was there. A temple dedicated to god Apollo was built there in the 7th c BC. The oracle of Apollo became a religious centre where common people and kings alike, came to consult the priestess of the sanctuary. Delphi was the most sacred place in the ancient world and thousands of pilgrims visited here, from kings and philosophers to common people to hear the prophesies of the Oracle and to watch and compete in the ancient games held here, the Pythian Games, similar to the Olympics. The ARCHAEOLOGICAL SITE consists of the temple of Apollo, the treasury houses, the theatre, and the stadium. 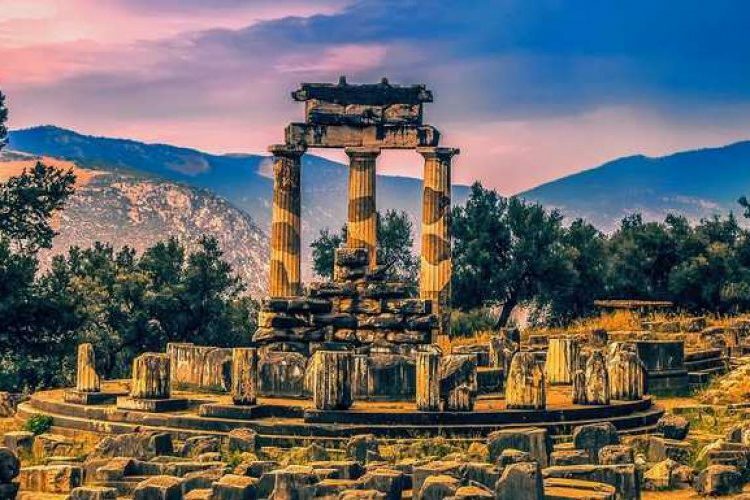 DELPHI is one of the best archaeological sites in Greece with ancient temples and shrines placed along the sacred way, making Delphi one of the best places to visit all year round. The site consists of the temple of Apollo, the treasury houses of the City States, the ancient theatre, the stadium at the top of the hill, the gymnasium, and hippodrome. The sanctuary was built in an imposing location, on the slopes of Mt. Parnassus. The Temple of Apollo, the treasury house of the Athenians, the Polygonal wall, the treasury houses of the different city States — where treasures from all over Greece were kept, and the Theatre are some of the most important building. The remaining part of the ancient site, bellow the road, with the temple of Athena Pronaia, the Tholos (a circular structure with 3 of its original 20 doric columns restored), the gymnasium and the sports facilities, used for training for the athletes that took part in the “Pythian or Delphian Games”, is not visited in the guided tours. Choose the tour without lunch and when the group is having lunch you can visit them on your own, without the tour guide. Today, next to the archaeological site, there is an impressive museum, displaying findings from the local excavations, that started 1892, masterpieces of Ancient Greek sculpture. The highlights are offerings by the oracle visitors, such as the famous bronze statue of the Charioteer, the statue of Antinoos, the famous athlete Aghias, the two “kouros” statues, the Roman “omphalos”, being the sculptured stone that represented the navel of the world, and many others. Seeing the beautiful stone structure, surrounded by mist, is enough to make you understand why the monks and nuns selected this area for unceasing prayer. Today, from the many monasteries that existed, only six are open to the public: The monasteries of St. Nicholas Anapafsas, Grand Meteoron, Varlaam, Roussanou, Holy Trinity and St. Stephan. It is worth noting that the religious monuments mostly visited in Greece are the Holy Meteora. Almost two million people visit the area of Meteora every year and admire this “unique” natural phenomenon. 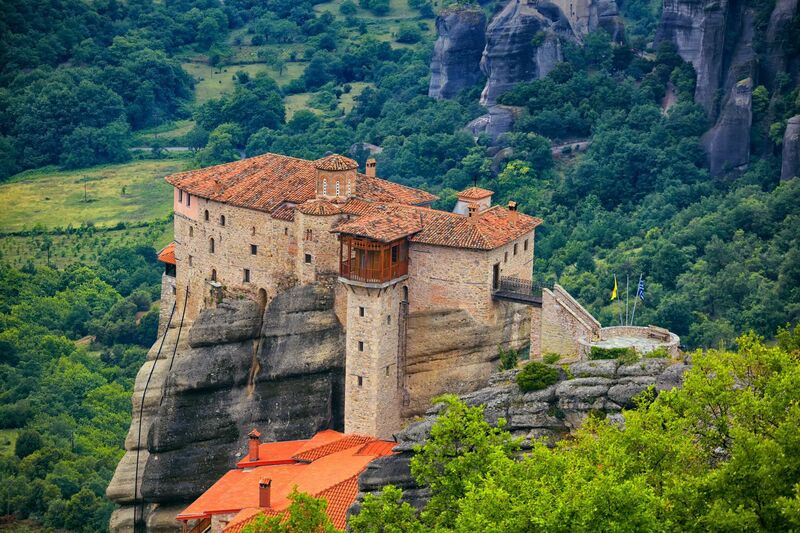 Meteora is a complex of Greek Orthodox monasteries built on natural sandstone pillars. Today four monasteries and two nunneries are open to the public. If there is one place that you must visit is Meteora in central Greece. This huge Eastern Orthodox monastic complex is unlike anywhere else in the world – and despite how overused this phrase is nowadays, at Meteora it means the exact picture. If the unearthly landscape of massive pillar-like mountains and columns weren’t striking enough, monks went ahead and built huge monasteries ON TOP of them 800 years ago. 6 of them are still working monasteries nowadays and are open to the public if you are willing to make the trek up to them. A view from Meteora is spectacular no matter where you stand, and it will make even the most seasoned traveler to say “wow”. Greece is full of spectacular sites, but you’d be hard-pressed to find one more unique and with so many fabulous views as in Meteora. The World Heritage monasteries of Meteora, in the middle of Greece, are one of the most extraordinary sights. 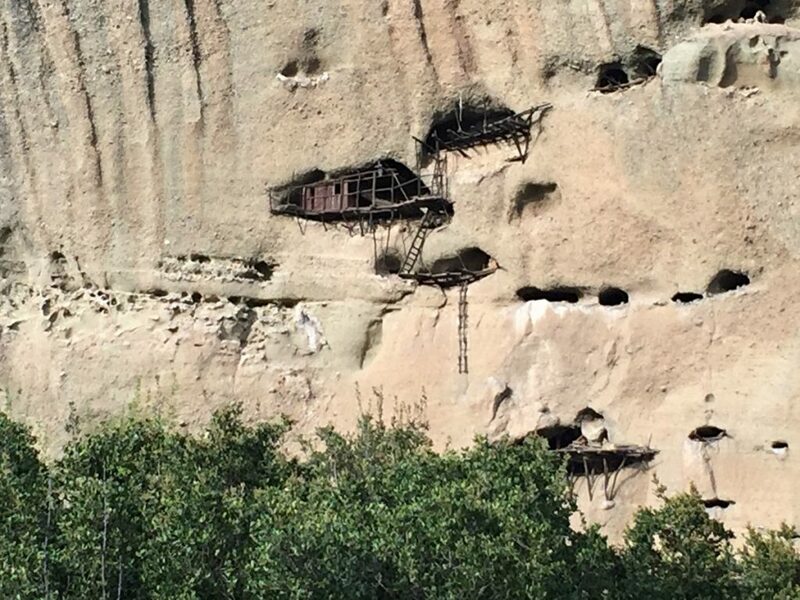 Built on top of huge pinnacles of smooth rocks, the monasteries provided monks with peaceful havens from increasing bloodshed as the Byzantine Empire waned at the end of the 14th c. The earliest monasteries were reached by climbing removable ladders. Later, windlasses were used so monks could be hauled up in nets, a method used until the 1920s. Apprehensive visitors enquiring how often the ropes were replaced were told ‘When the Lord lets them break’. Don’t miss this unique place at this special price! The monks’ love of God and of monasticism and asceticism formed the impetus for this miraculous way of life on the rugged spires of the plain of Thessaly. Monasticism is the highest calling and the path that leads most directly to holiness. It is the complete devotion of the human person to the triune God. It is the imitation of the angels in divine love, chant, obedience and the ministry of souls, which is why it was called ‘equal to the angels’ and an ‘angelic state’. The entire life of a monk consists in fully opening the heart to God and keeping His commandments, in constantly striving for sanctification and praying continually. Whether working, studying or in the stillness of prayer, the monk is unceasingly crying out to the Lord in the heart with the brief prayer, “Lord Jesus Christ, Son of God, have mercy upon us”.